Are you looking to get a gift for someone who is in the process of adopting? What about for your adopted child? Maybe you want to find something meaningful for your child’s birth mother, or honor your children’s grandparents? There are so many cute gifts to find at the Adoption Gifts Shop found at AdoptionGifts.com. Here are some especially cute ideas. You really can’t get anything much cuter than a onesie! If you or someone you know is adopting an infant, scrolling through the onesie section is a must! You can scroll through the many cute adoption slogans, find your favorite, and voilà, a super cute and meaningful onesie for the newest little addition. When you are celebrating a new addition to the family, what better way to celebrate with family, than by giving out personalized t-shirts to commemorate the occasion! It’s such a cute idea to give to everyone in the family–siblings, parents, grandparents, and even to your new addition. 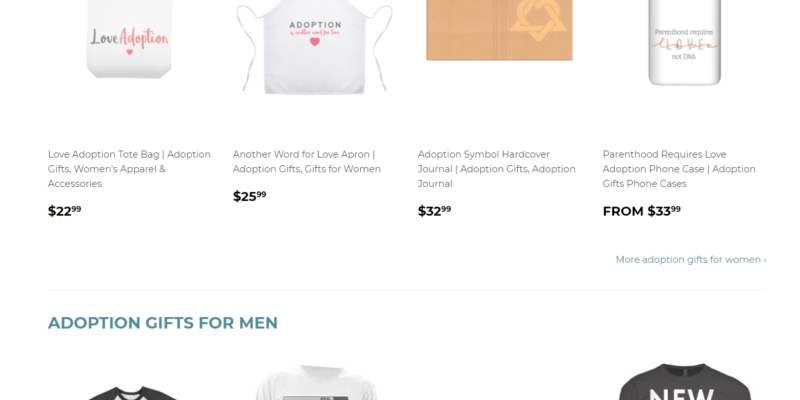 You can choose t-shirts that say their role with adoption hearts, or proclaim their role as new! You can choose your favorite colors, or pick matching colors! Those would make some awesome family photos for your momentous adoption day! Can you picture your adopted child with a shirt that says: “I’m so loved” or “Adopted, Prayed for, Chosen, and Forever Loved!” standing in the middle of the family and everyone else wearing t-shirts that say “New Mom” “New Dad” “New Big Brother” “New Big Sister” “New Grandma” “New Grandpa”? A priceless photo for sure! This is such a cute necklace! What a beautiful and meaningful gift for your adopted child. It is three necklaces (one piece for each parent and one piece for the adoptee). Each necklace is a puzzle piece. 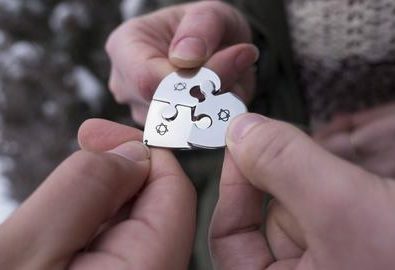 The three puzzle pieces fit together to create a heart. What a great way to begin the attachment process: Giving your adoptee a necklace that fits with yours. That necklace will be a tangible reminder of your love for your child. When your child sees you wearing the necklace it will remind them that they are yours and are loved. Such a cute blanket to tuck your adoptee in at night. They can fall asleep every night reading “loved” and every morning they will wake up with the reminder that they are loved! What a beautiful idea. We can never tell our children enough how much we love them. Tangible reminders are so important. Do you know someone who is adopting? Why not buy them a super cute children’s book about adoption? I Prayed For You, I Wished For You, and Over The Moon are such perfect gifts for your friends or family who are adopting. Adoptive parents will appreciate having stories to read to their child about how much they are loved. Maybe you know an awesome foster family or adoptive family. You know that those foster and adoptive parents work hard to provide love and a stable environment for all the children that come into their home. It’s not always easy. Why not encourage those foster or adoptive parents with a cute mug sporting an inspirational quote? That mug might be the perfect way to encourage those tired parents during their morning coffee. These nifty journals are also a really cute gift idea for those adoptive or foster parents in your life. Why not encourage them with the gift of a beautiful journal. Adoptiongifts.com has quite a few you can choose from. Sometimes it’s nice to be able to capture the adoptive or foster journey through words or to use it as a prayer journal. You may have an open relationship with your adoptee’s Birth Mom and you are looking for a way to honour her. Adoptiongifts.com also has some really cute gifts for the beautiful Birth Mom in your life. You can encourage her with a “Birth Mom Strong” shirt or a cute “I love my Birth Mom” beanie hat for your little one when they visit their Birth Mom. Whether it’s a gift to remind your adoptee how precious they are to you, or a gift for a beautiful Birth Mom, AdoptionGifts.com is a really great place to find meaningful, cute gifts to give. Make sure you check the online gift shop out! Theresa is married to her best friend and together they are raising three beautiful children (one through the blessing of adoption) and look forward to the day when they can be reunited with their two heavenly babies as well. Theresa is a teacher, but is currently working as the Children's Ministry Director at the church they attend. She hopes that her writing will be a source of encouragement to those reading--that there is always hope.